Happy Cinco De Mayo! Wait,What? It’s over? Oh well, as usual, I’m a few days late and a couple dollars short! The good news is, I have an incredibly easy taco recipe for you! Anndd..it’s healthy! Shhh…don’t tell your husband, or your kids! **6 large lettuce leaves, washed and dried** Or taco shells, tortilla chips, whatevs! Heat a large nonstick skillet over medium heat. Add turkey; cook stirring frequently for 5 minutes or until no longer pink. Add garlic powder, cumin, salt, chili powder, paprika, and oregano; mix well. Add onion and bell pepper, cook stirring frequently for 4 to 5 minutes, or until onion is translucent. Add water and tomato sauce. Bring to a boil Reduce heat to low; cook, covered for 10 to 12 minutes. Top each lettuce leaf evenly with turkey mixture, tomato and cilantro. And let’s throw in a side dish for good measure! Nothing like a good ole Spanish Rice! 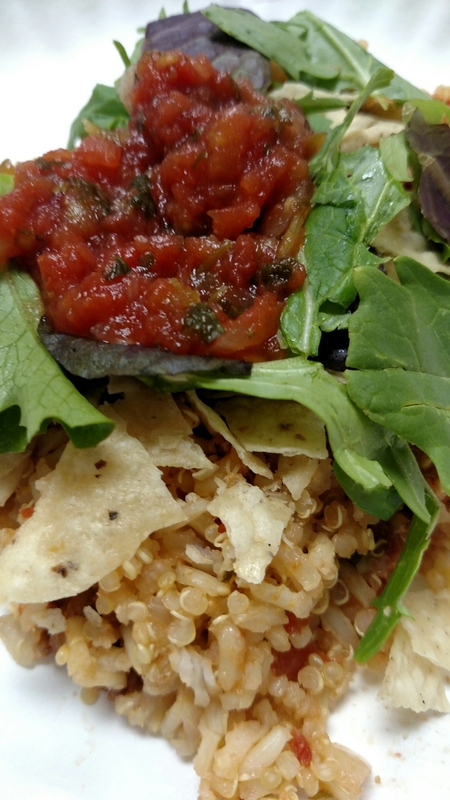 Here it is in all it’s glory, quinoa/rice blend topped with turkey taco meat, a pinch of cheese, organic greens, fresh salsa, and a few crispy tortilla chips! Even better when you wash it down with a nice dos equis glass of water!